Tulsa, OK — Tulsa police officer Betty Shelby never spent a day in prison for killing 40-year-old Terence Crutcher. 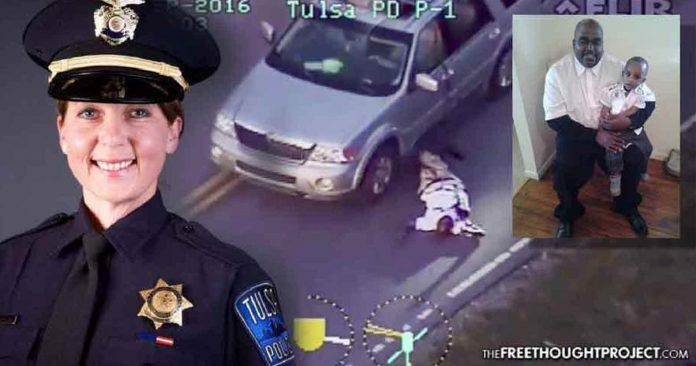 In fact, last year, Shelby was allowed to return to her job on the police force but the public was reassured that this trigger happy cop would not be allowed to patrol Tulsa’s streets. Fast forward to this week, and that has changed. This killer cop is now back on patrol. Shelby stayed on at the Tulsa police department after her trial but then joined the Rogers County Sheriff’s Office. According to the Frontier, Rogers County Sheriff Scott Walton told them on Monday that Shelby had become a full-time deputy “a few months ago” and has had no issues on the job. Walton then went so far as to praise this killer cop. Scott Wood, one of Shelby’s attorneys during her manslaughter trial, said that Shelby had been “invigorated” by the response she’d received while in Rogers County, according to the Frontier. “I think she’s pretty happy right now,” Wood said. Shelby’s trial concluded last year when she was found “not guilty” of manslaughter by a jury of her peers. The jurors also wanted to go on record as saying she is not without blame. Shannon McMurray, Shelby’s lawyer didn’t appear convinced her client would return to the force, even expressing doubt it would be a good idea. “She’s going to self-guess herself and get herself killed or somebody else,” McMurray said, implying she may still be a danger to society. All that has now been thrown out the window. According to the Associated Press, the Crutcher family petitioned the city to prevent such a reinstatement of her employment. However, this was obviously in vain. Crutcher’s death was captured on video from a police helicopter which was flying overhead. Shelby’s husband, Dave Shelby, was in the chopper and watched as his wife made the decision to shoot Crutcher, who died from his injuries. Shelby even took her case to the court of public opinion, granting an interview with 60 Minutes where she discussed the shooting in detail. In her interview with 60 Minutes, he said Crutcher wasn’t obeying her commands and was acting “Zombie-like.” She said she began to fear when he ignored her orders. “I’m thinking he’s calculating how he can get to his vehicle to get whatever weapon it is that he’s going to get because he didn’t find it in his pocket,” she said. She then blamed her shooting Crutcher — on Crutcher. Shelby said she fired her weapon out of fear because Crutcher ignored her commands to lie down and appeared to reach inside his SUV for what she thought was a gun. But prosecutors said she overreacted, arguing that Crutcher had his hands in the air and wasn’t combative, part of which was confirmed by police video that showed Crutcher walking away from Shelby with his hands above his head. The father’s killing drew outrage from the community and the nation as a whole. McMurray acknowledged her client could have chosen a less-than-lethal method of subduing Crutcher but added her client had to make a “split-second” decision. Just like that — cops can kill unarmed, non-violent, and arguably innocent fathers on video, and not only be acquitted — but still be cops. Hopefully, none of the citizens of Rogers County ever encounter Shelby during one of her fits of fear when she is forced to make another “split-second” decision and kill another unarmed father, mother, son, or daughter with their hands up.